Five generations of the Caputo family have built on tasty Italian traditions in the heart of the Cobble Hill neighborhood. 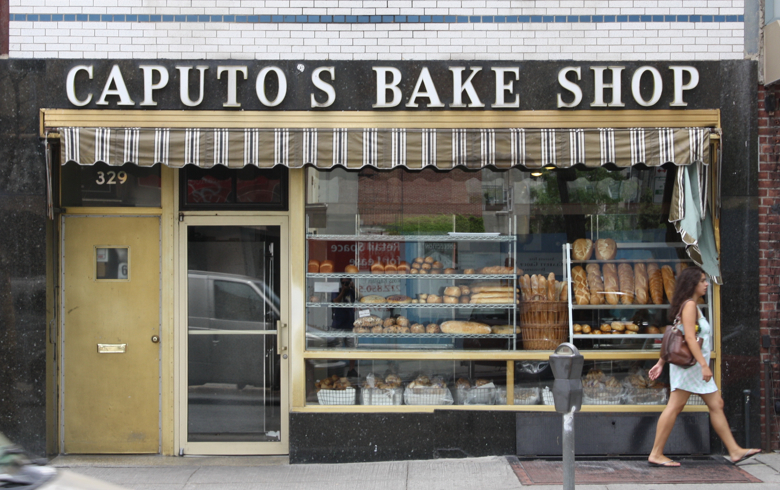 When my nephew Nick, who grew up in the same family bakery I did, recommended Caputo Bakery in Brooklyn, I knew it would be special. 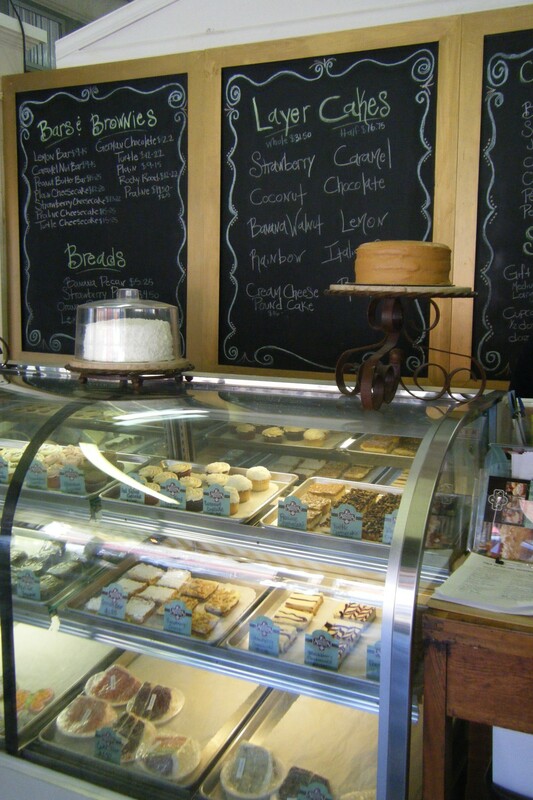 Nick is as much of a Bakery Boy as I am, with a similar lifelong habit of sampling bakeshops everywhere. During five years of living in New York City, he’s scoped out some winners. 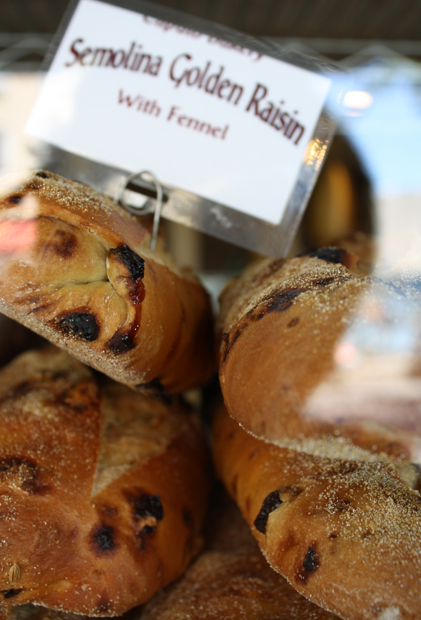 Even from outside, I was impressed by the variety of great-looking breads stacked on trays and in baskets in the front window. Without hesitation I bought a crusty loaf of French bread for $1.90 to snack on while I checked out the rest. Before long I was asking a saleswoman—who sniffed at, but politely ignored, my crumb-dropping—to bag up a loaf each of Semolina Golden Raisin (with fennel), Multigrain (with whole wheat, oats, sunflower seeds, millet, flax, and cracked wheat), Cranberry Walnut Multigrain, and Sweet Onion Focaccia. “Wha, you don’t want the Scalita and the Olive bread too?” the saleslady mock-scolded while packing my order. Okay, I conceded, add one each of those—the first a dense, dry Sicilian loaf good for dunking in soup, the second glistening with an olive oil smear. I lived off of Caputo’s bread and hardly anything else for the next couple of days, with a smile on my face. 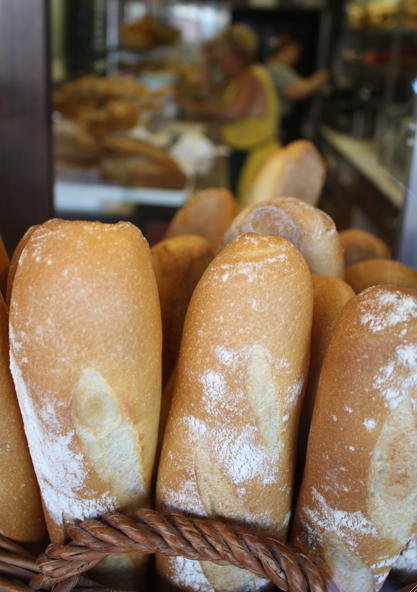 BEYOND BREADS Bread takes center stage at Caputo’s, but this well-rounded Italian bakery produces other noteworthy goodies too. 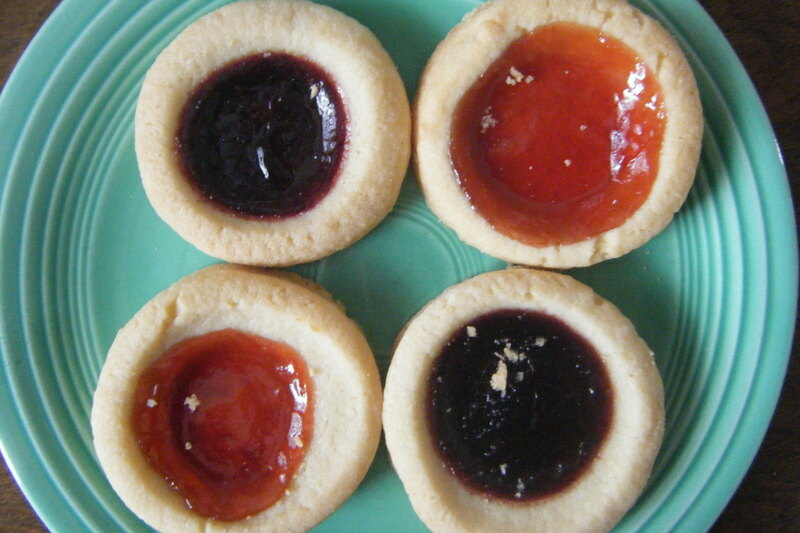 Excellent biscotti, butter cookies, and tart little lemon cookies stand out. They also make beautiful strawberry and other fruit pies, chocolate layer cakes, pound cakes, cupcakes, and brownies. HOURS Mon-Sat 6:30 a.m.-7 p.m., Sun 6:30 a.m.-5:30 p.m. 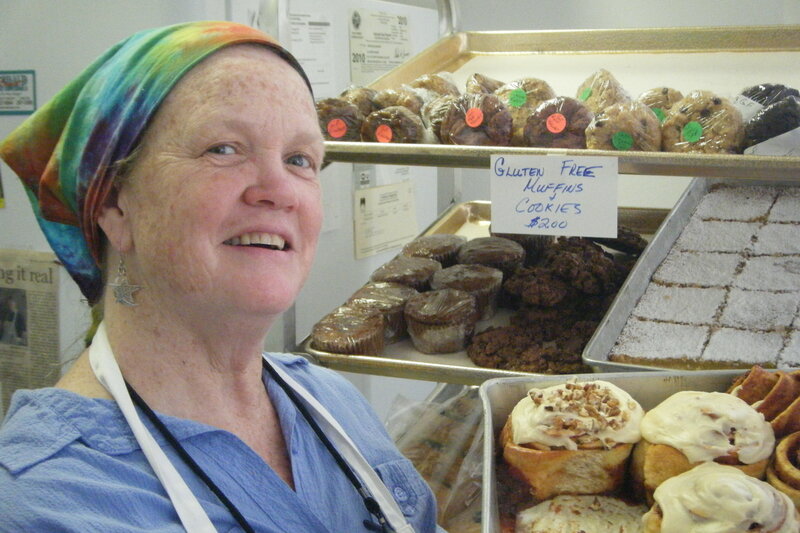 In a shop named for a Grateful Dead song—in a tiny Mississippi town you likely never heard of—a layer-cake fairy works magic. 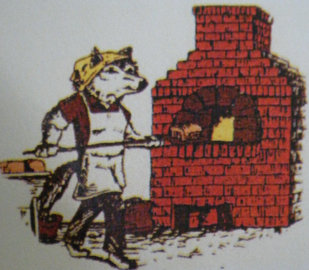 I stumbled upon Sugaree’s Bakery quite by accident, the kind of lucky accident that makes being Bakery Boy so much fun. 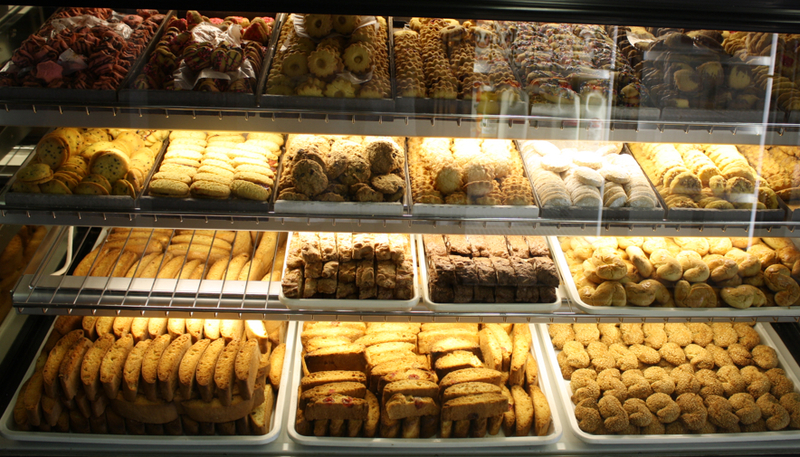 Driving from Birmingham to Memphis one spring day, I stopped at Tupelo, Mississippi, to check out some bakeries. On a lark 28 miles further up the road I took a quick detour into New Albany, a population-7600 town I’d never heard of, and there it was. 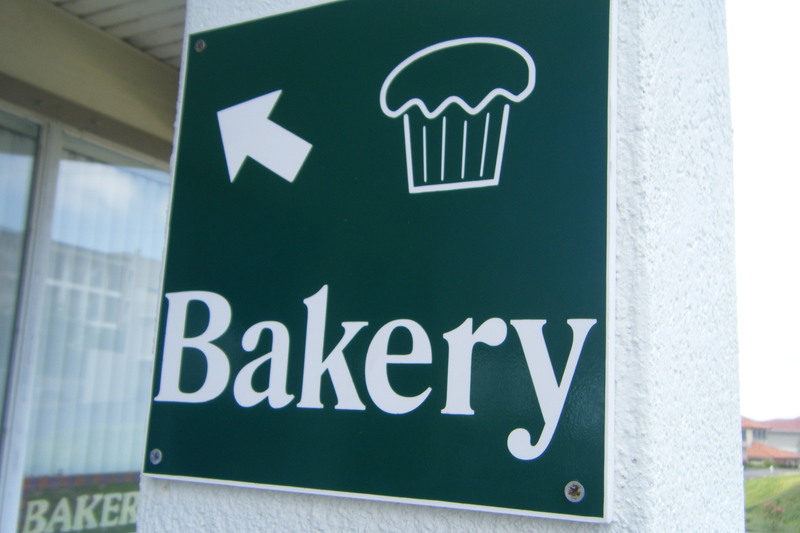 A cake-holding fairy logo floats over the name above the retail entrance to this bakery in a former pharmacy. It’s part of a thriving, historic, two-block-long business district along Bankhead Street, where even with free angled spaces available, locals habitually park cars in a center lane you’d think was reserved for left turns. 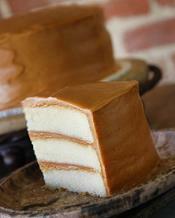 Inside, a host of gloriously tall layer cakes with gleaming frosting overwhelmed me. 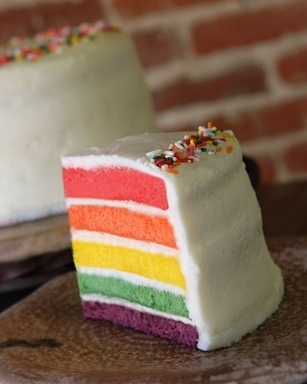 I tried slices of the two best sellers, Caramel and Strawberry, as well as the colorful and kid-favorite Rainbow Cake. I could have sampled my way through other cakes including Chocolate, Coconut, Red Velvet, Banana Walnut, Italian Cream, Lemon, and Cream Cheese Pound Cake. Instead I found myself mesmerized by bites of Caramel Chocolate Walnut Bars, Lemon Bars, Peanut Butter Bars, Coconut Balls, and pretty little Petite Fours. So as not to enter a sugar-induced a coma, I saved the bulk of my samples to nibble during the 90-minute drive to Memphis. Clearly there’s a bit of fairy magic going on at Sugaree’s and, considering the size of the biggest jelly-filled thumbprint cookies I’ve ever seen, maybe there’s a giant working in the back room too! SING ALONG Owner Mary Jennifer Russell named her place for a Grateful Dead song (click here for lyrics) with an infectious slow groove and the memorable refrain, “Shake it [pause], shake it [pause], Sugaree.” If you know the tune, just try getting it out of your head for the next hour or so after you read this! FRIDAY SPECIAL Walk-in customers look forward to Fridays when Sugaree’s makes its famously gooey and piled-high Chocolate Meringue Pies. 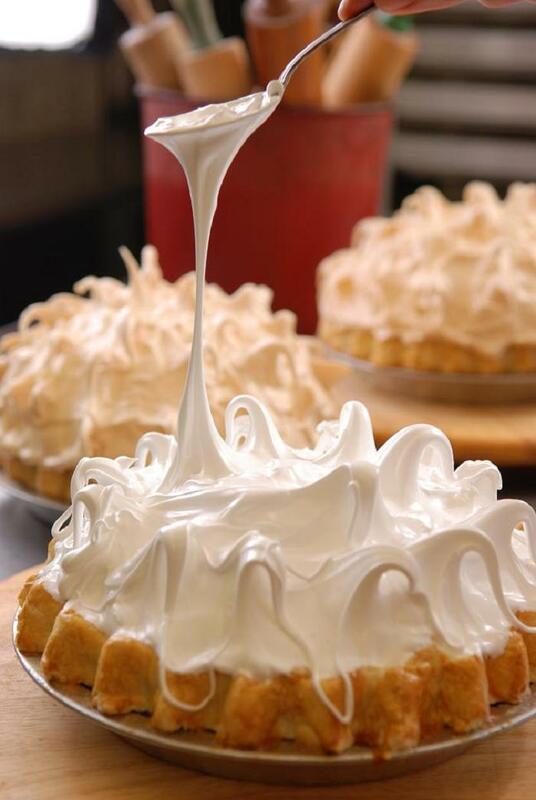 “Each one has a pound of pastry crust, three pounds of chocolate cream filling, and a pound of meringue,” Mary says. Next time I go, I’m going on a Friday! WHY HERE? “New Albany is my hometown and it’s where I want to be,” Mary explains. “I studied biology in college and was a pharmaceutical sales rep, but after being laid off three times in five years from different companies, I decided I wanted more control over my life. I learned cooking and baking from my grandmother while growing up, so I started with a $200 investment in some basic equipment and grew Sugaree’s from there.” Although Mary didn’t grow up in a bakery, her daughter Sylvia, now 6, will someday be able to make that claim. LOCATION 110 West Bankhead Street, New Albany, MS 38652. It’s just off U.S. 78 (the future I-22 when construction is complete) 28 miles northwest of Tupelo and 80 miles southeast of Memphis. 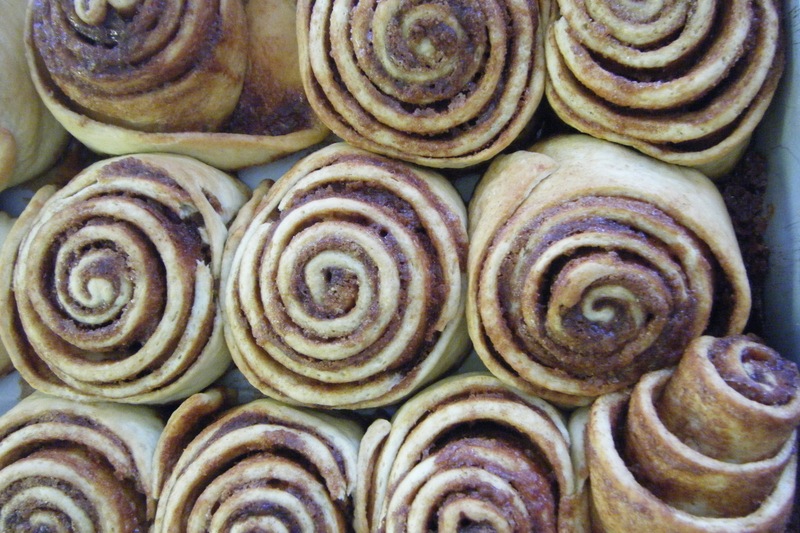 HOURS Tue-Sat 10 a.m.-5 p.m.
Hidden behind a bike shop in a Florida Panhandle beach town, La Loba’s makes giant cinnamon rolls, great scones, whole-grain breads, gluten-free granola & more. Her current venue for La Loba’s Bakery—a cramped nook behind Big Daddy’s Bike Shop and a health food, herbal supplements, and massage therapy joint called For the Health of It—has Gwynn thinking she’ll stay put for a while. 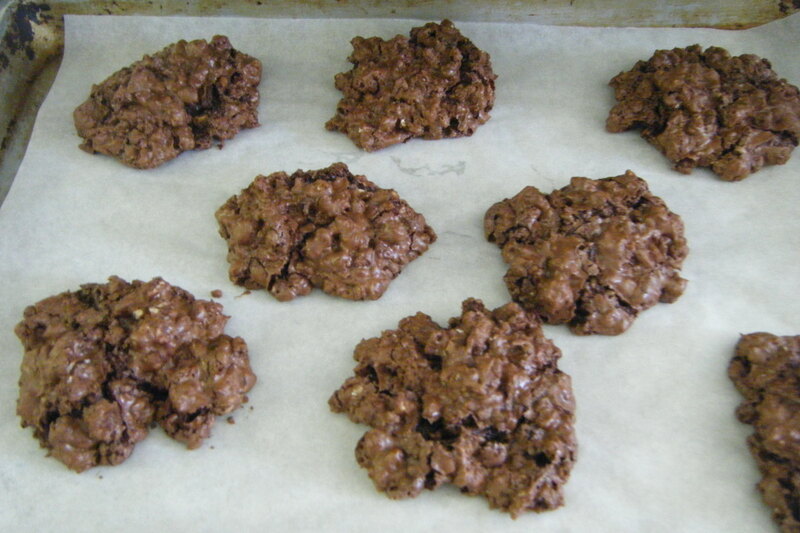 like marvels that resemble lumpy mud puddles. 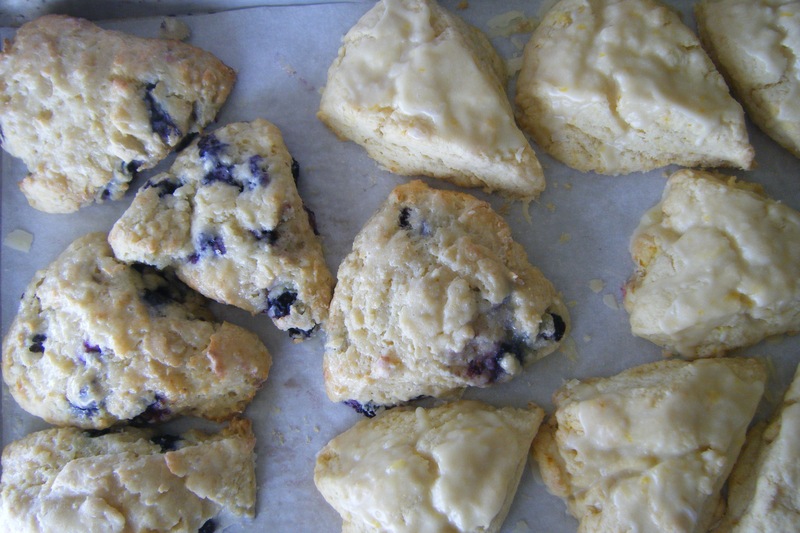 Scones made with fresh local blueberries or orange peal zest resemble thick, soft clouds and come with or without an almond-lemon or orange glaze. Layer cakes—including chocolate with chocolate butter-cream frosting, carrot with cream cheese frosting, and coconut—come whole or by the slice. $15 LOAF! When I saw a single loaf of bread priced at $15, I just about freaked. 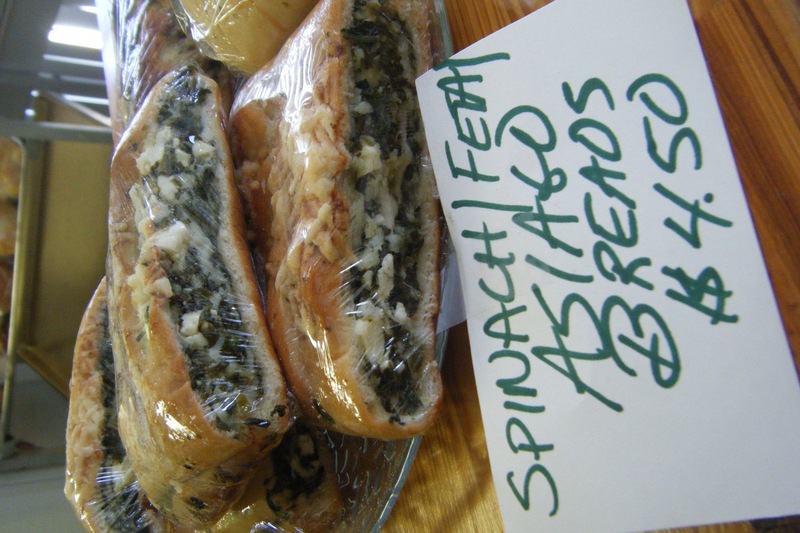 But when hefty olive-mozzarella-asiago and spinach-feta-asiago loaves came hot from the oven, I realized they were worth it. They’re more like garden-fresh meals wrapped in whole grain or tasty pizzas rolled into loaf form. At $4.50 for a quarter portion, they make nice individual lunches on their own or go well with the beans-and-rice dishes La Loba’s sets out at midday. 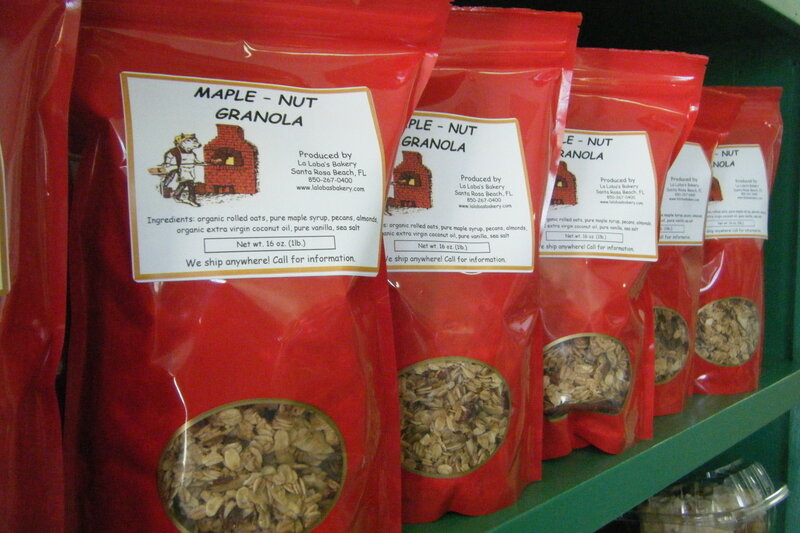 Maple-Nut Granola flies off the shelves. 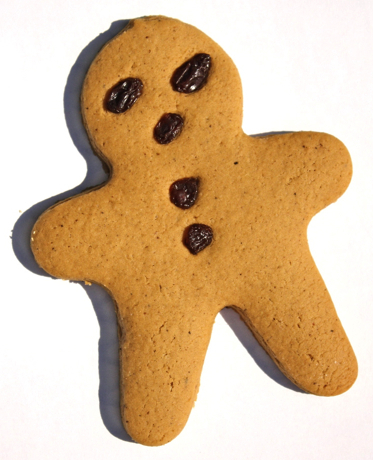 Yes, Baker is baker Gwynn's real surname. Basil & rosemary for this pizza grew in La Loba's garden. 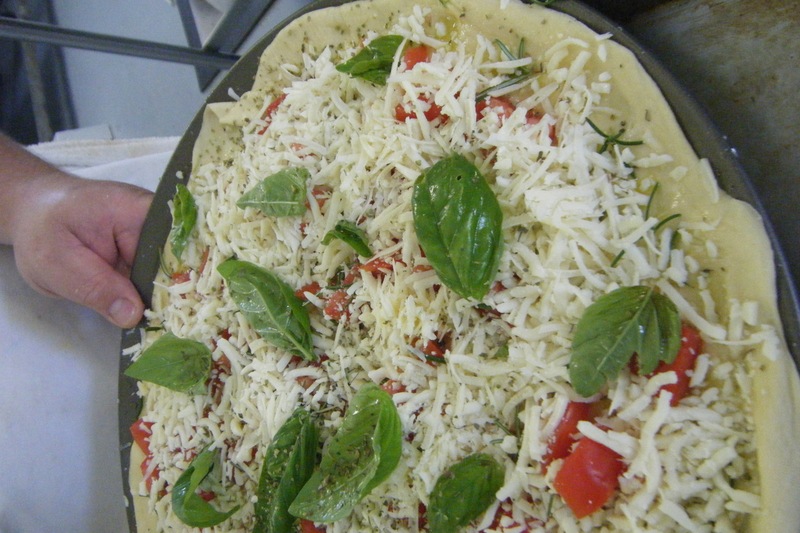 Fresh tomatoes, asiago & mozzarella came from certified organic sources. LIKE FAMILY A handful of fellow bakers help with production. “We’re like a family, even if we aren’t all related,” Gwynn says. “What we have in common is an appreciation of natural ingredients. 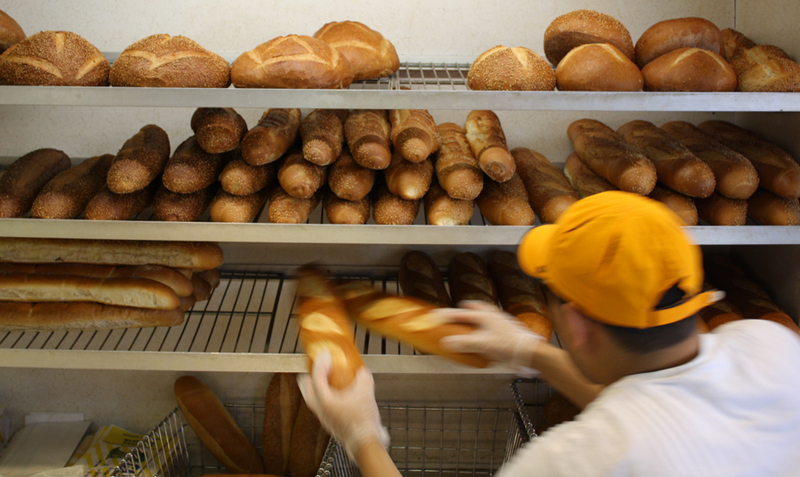 We use only real butter and sugar and eggs, fresh and local fruits and vegetables, and whole grains. 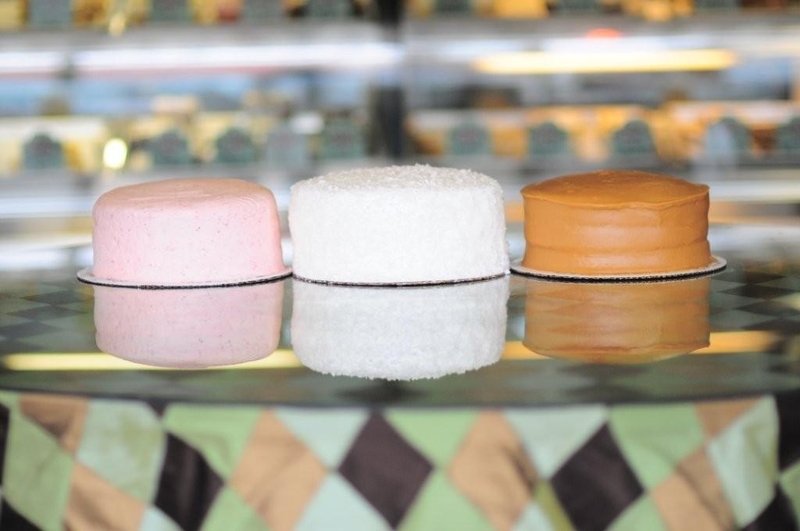 We don’t use artificial colors or preservatives, hydrogenated fats, or high-fructose corn syrup. We share an enthusiasm for healthy food and try to keep a sense of humor while spreading the word about organic methods and sustainability. Arrows lead to La Loba's, hidden behind a bike shop. LOCATION 2217 West County Hwy 30-A, Blue Mountain Beach, FL 32459. It’s on Scenic Highway 30-A, a brief and beautiful offshoot of U.S. 98 about midway between Fort Walton Beach and Panama City Beach in Florida’s northwestern panhandle. HOURS Mon-Sat 9 a.m.-5 p.m.